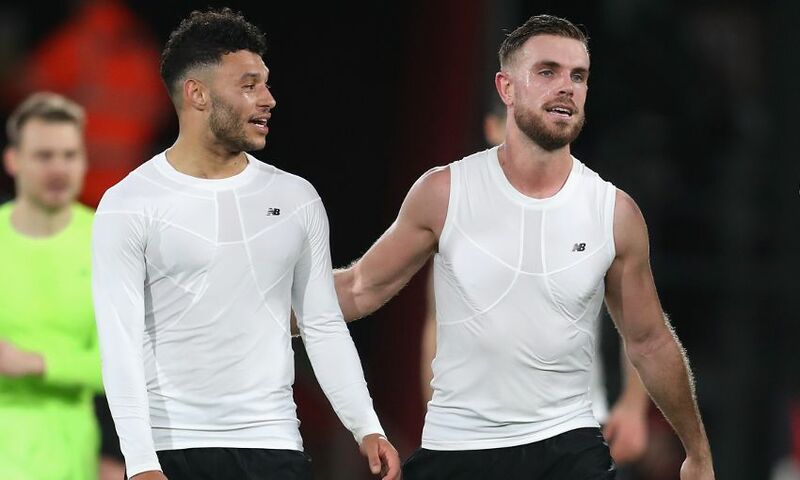 Jordan Henderson has paid a glowing tribute to Alex Oxlade-Chamberlain’s ‘inspirational’ attitude as he continues his rehabilitation from a long-term knee injury. The midfielder has been out of action since sustaining multiple ligament damage against AS Roma at Anfield in April, but began running outside at Melwood recently as Jürgen Klopp admitted he is 'ahead of schedule' at Friday's pre-Arsenal press conference. And Henderson has praised the mentality of his teammate as he continues on his long journey towards full fitness. Henderson wrote in his column for the official matchday programme: “Alex Oxlade-Chamberlain made everyone smile with a posting on his social media over Christmas when he revealed he’s back running on the grass pitches at Melwood. “Maybe it is testimony to the size of his personality and impact he still has at Melwood that it was only when reading his caption it hit me we have been without him for eight months so far – albeit with some of that over the close-season, obviously. Although Ox kept it under wraps for a long time, the full extent of the lay-off he was facing was known to us as teammates more or less straightaway. I remember the gaffer saying after the Roma home game – the game he got injured in – that the injury, along with what happened to Sean Cox that night, meant it was hard to properly enjoy and celebrate what was a fantastic night. When you think back, there was arguably no better player in Europe at that moment doing what he was doing for us; he was fundamental to our run to the Champions League final. “It was typical of Ox that he took the decision to delay revealing exactly what he had done until after the season had finished, as he didn’t want anything detracting from the Champions League final or for the news to be a downer for the club and the fans. Obviously it’s different circumstances for each individual, but like most players I’ve spent periods out with injury during my career and mentally it is so hard. It’s not a case that you’re made to feel isolated, but unfortunately that does become a consequence of it. “The other lads are cracking on with the day-to-day preparations for a game and you have to focus on an individual programme with a very different target. The boys will be together, training outside, and you’re usually going through your rehabilitation programme indoors with the medical team, itching to get out there and join them. “The lads here are great and I’m sure Ox will tell you he’s had brilliant support from everyone – and also from our supporters all over the planet. But all the support in the world can’t replace the buzz of being involved in and around matchday and getting onto the pitch and contributing. Knowing how tough it is makes the attitude the Ox has shown during his rehab inspirational beyond belief. He’s a massive character, as I’m sure all the Arsenal players and staff who were with him during his time there will testify to, so he’s someone that can influence a group in a positive way through force of personality. “Although he’s still relatively young, Ox is someone all of the dressing room look up to. He is a person with whom teammates of all ages, young and old, will talk things through and bounce ideas off. I’m sure there are times when he is down, but he has never shown it around the team. I’m sure there have been times when it’s been hard to be energetic and enthusiastic at Melwood, but again he’s never shown that around others. I’m sure there are times when coming to matches and supporting the boys is hard because it emphasises what you are missing, but he’s always one of the loudest voices cheering us on. “The really great news about Ox, aside from him being outside running on the grass again, is that from the moment he had the operation we knew it was positive news and he would return back to his very best at the end of his rehab. The medical staff are always keen to keep pressure off players and as with anyone who faces a spell out, the priority is to come back right and ready rather than rush it. Ox is too important to our present and future to take any chances with being impatient, so none of us will be applying any pressure on him, as keen as we are to getting him back out there with us. Pick up your copy of the official LFC matchday programme at the stadium today, or subscribe online by clicking here.